Join the discussion on our forums! 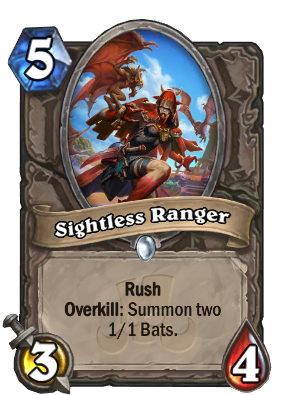 Come discuss Sightless Ranger over in our dedicated Sightless Ranger discussion topic. Rush. 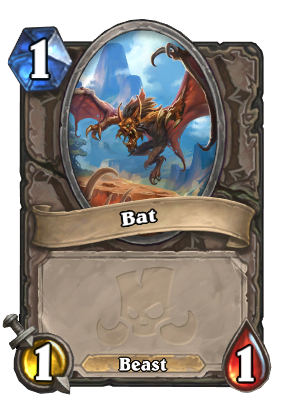 Overkill: Summon two 1/1 Bats. An eye for sore sights. Above average in arena. And that's it. Often enough, most classes in a lot of deck types will have something small on the board , not just aggro or tempo. While it's debatable if it's too slow or not for aggro, you'd likely be able to blow up a two hp minion on a turn five or coin four. In a case like that, leaving a body with two more 1/1 minions could be very big, the beast tag possibly coming into play depending on the class as well. Overkill works on death as well, so you can even trade this into one of those Cursed Disciples too. This will be good in arena. It won't be a star in constructed, but it's not going to be as lacking as it might seem at first. That said, against any stalling combo mage with near no minions or other similar decks, it will indeed be powerless. Rush + Overkill is great but those stats are definetely not for standard mode. Although I do like the fact of Team 5 making those cards balanced. They might be played after rotation happens so that would mean pretty balanced environment.